Another 10-try haul and another five-point win kept Biggar top of Tennent’s National Division 2 with Saturday’s thumping 58-7 home success over Falkirk. Biggar opened strongly and had their first score within four minutes, a neat cross kick from Conor Lavery being gathered by Ross Bradford who went over in the corner but just too far out for the conversion to be successful. Falkirk took advantage of several penalty awards to tap and go and this ensured Biggar were kept on the defensive but a Lavery kick pushed Falkirk back, forcing a drop out 22. A break by locks Alan Warnock and then Andrew Peacock created an attacking position, Ryan Moffat breaking on the blindside to take play within five metres where his neat off-load was taken by scrum half David Reive who dived over in the corner. On the left side of the pitch meant that it was the ‘right’ side for Lavery who added the conversion for a 12-0 lead. Quickly back on the offensive, Biggar’s third was Bradford’s second, the winger benefitting from an excellent Lavery pick up and pass. Gregor Stewart was then forced off the pitch after taking a series of hits to his chest with Robbie Orr coming into the side at full-back and Robbie Lavery moving to centre. The youngster was barely on the pitch before he rounded off a great attacking move by collecting a pop pass from Rowan Stewart who had made good ground on the left flank to go over for a try. The all-important fourth and therefore bonus point winning try was converted by Lavery for a 24-0 lead. This soon became 29 when a deft pass under pressure from Robbie Lavery put Matthew Stewart into space, the youngster’s pace taking him clear and then round the Falkirk defence for a cracking try, Lavery uncharacteristically missing from close range. Reive was shown yellow by referee David Young when he killed the ball during one Falkirk attack this leading to another switch for the versatile Robbie Lavery who took over at scrum half. His first role ended in upset however as the ball squirted out of the Biggar scrum and with the Biggar back line preparing for a clearance it was Falkirk No 8 Stewart McCulloch who reacted first to dot down for a try converted by Finn Call. Leading 29-7 at half-time, Biggar continued their dominance in the second half. Voas picked up from the ruck to thunder over from 10 metres for the first score of the second period. It was Chris Milligan who rounded off the next attack with Conor Lavery again notching the conversion. Further tries arrived from Alan Warnock and Rowan Stewart, with Orr kicking a conversion. 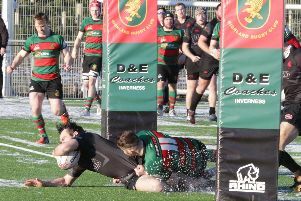 This was a very impressive Biggar display and they will be looking to continue their fine form when they travel to Whitecraigs in the league this Saturday, kick-off 3pm.